Description: F. benjamina is commonly used as interior foliage plant. 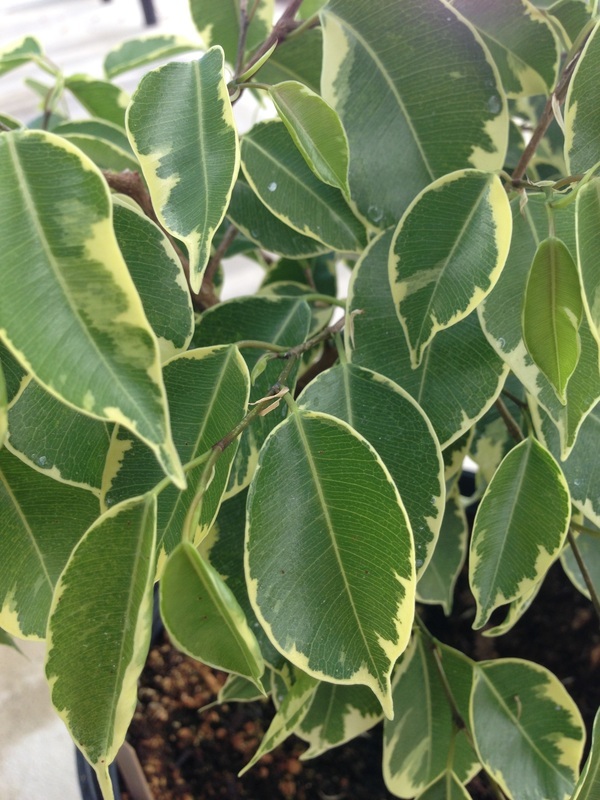 However, ficus trees may also be grown outdoors in climates where freezes are infrequent. Leaves are simple (composed of a single blade) and are found in a variety of green colors. The plant may be pruned into shrubby or tree-like forms. As the plant produces multiple stems at the base, these stems be braided together and will eventually fuse as the vascular cambiums combine into a solid trunk. Fertilization: Feed every 6 months once the plant is established in the pot. Use: Houseplant or exterior landscape plant for warm climates. Propagation: Cut a 4-6 inch long woody stem cutting, in dip in rooting hormone, and place them in moist vermiculite. Keep vermiculite moist until the cutting roots, in about 2 weeks. Allow an additional month for roots to fully develop (establish), and then transplant into new pots. Special Accommodations: Benjamin figs are sensitive to cold. Avoid areas where temperatures will freeze or freezing gusts blow. Leaves are toxic to small animals if consumed in large quantities.